Although it has been over 10 years since Blu-ray first came out, DVD is still far more popular than Blu-ray. However, DVD can only be played with DVD players or BD players on TV or computer. Popular potable electronics such as smartphones, iPad and iPod are not compatible with this aging technology. How can I enjoy DVD movies on the go? Well, DVD rippers bring us the solution. This kind of miraculous software can help to convert DVD movies to videos in formats supported by various popular media players with several clicks. As there are a large number of DVD rippers available in the market, it’s not easy to tell which one is the best DVD ripper software. This post, after testing most of all DVD rippers, introduces top 10 best ones and makes a comparison between those best DVD ripping software. This fabulous DVD converter enables you to convert any kind of DVD without any barrier. It can help you to remove all the restrictions of DVD like CSS, Region, RCE, Sony ARccOS and Puppetlock. With the NVIDIA® CUDATM technology, the conversion is processed on NVIDIA’s GPU instead of your computer’s CPU, leaving more of your CPU available to handle other applications. Thus Aimersoft DVD Ripper has six-time-faster standard and high-definition video conversion, higher quality, and smoother playback for all videos. With a built-in video editor, you are also able to customize DVD movies as per your needs. You can rotate the videos, apply special visual effects, change the video parameters, trim, cropping, add subtitles, watermarks and so on. 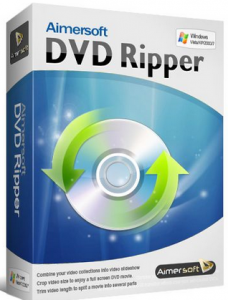 WinX DVD Ripper Platinum is a Windows-based DVD ripper software that can rip any DVD (even latest encrypted DVD discs/ISO images) to mainstream videos, for example It can rip DVD to AVI, DVD to MP4, H.264, MPEG, WMV, MOV, FLV and M2TS. It can also helps faultlessly to convert DVD to Apple (iPhone/6/6 Plus/5S, iPad/Air 2/mini 3, iPod/5, Apple TV/3), Android (Google New Nexus 7, Samsung Galaxy Note 4/Edge/S5 (Mini), HTC One M8, Amazon Kindle Fire HDX), Microsoft (WP8, Surface Pro 3, Xbox One), Chromecast, Sony PSP/PS4, Nokia Lumia 2520, etc. This DVD ripper brings fast DVD ripping solution due to the cutting-edge tech to support Multi-core (up to 8) CPU and Hyper-threading. Besides 350+ built-in profiles, this DVD ripping software has 4 DVD copy modes to meet users’ up-to-date DVD backup demands – clone DVD disc to ISO image, to a folder at a 1:1 ratio, backup DVD main title content for playing on PC, PS3, PS4, Xbox, Media Center, etc, and copy DVD title fully to a multi-track MPEG2 file, including all videos/audios/subtitles. As a professional DVD ripping program, Leawo DVD Ripper can effortlessly escalating your home DVD movie experience without DVD player. According to your requirement, it can rip and convert DVD to video in more than 180 different video formats including MP4, WMV, MKV, FLV, and F4V. In addition, as the most popular DVD ripping software, this DVD ripper can also act as a DVD audio ripper by converting DVD to audio in MP3, AAC, etc. In this way, it lets you enjoy DVD movies on most popular mobile devices like iPhone 6 Plus, Galaxy S5, Lumia 1520, PS4, Xperia Z, Surface Pro 3, etc. The built-in handy video editor helps to customize video effects, including trimming, cropping, adding effects and watermarks. To create 3D movies, it provides different 3D modes for you to choose and set. For more detailed settings, you can set profile parameters, select subtitle/audio track, merge files into one, etc. DVDFab DVD Ripper is one of the best DVD rippers for you if you want to watch DVD movies freely on any other media player devices. It will rip DVD video content from a disc, folder or image file to multiple formats suitable for iPod, iPhone (iPhone 6 and iPhone 6 Plus), iPad (the New iPad), ZUNE, NDS, Apple TV and any other playback device, with high quality and fast conversion speed. It can also extract only the audio tracks for use with music players or other applications. It comes with preset profiles for many devices for simple, error-free setup and great output quality for your specific device. Generic presets are also available to accommodate other devices or video streaming applications. Want to rip more than one title at a time? Then use the handy batch conversion mode that is built in. And even using the preset profiles, it allows user to control over settings for frame rate, output resolution, video and audio bitrates, audio sample rate, image cropping and many more. Plus, DVDFab DVD Ripper provides an interface that is perfect for new or experienced users, making it easy to get great results. Open DVD ripper 3 is very smart DVD ripping software to rip DVD movies with a variety of functions and incomparable quality. This magical DVD ripping tool enables you to rip DVD movies to various video and audio formats, such as AVI, MKV, WMV, 3GP, MP4, MOV, RM, ASF, MP3, M4A, WAV, MPEG-1/2, VOB, VCD, SVCD and so on, and encode AC3, MP2, WMA, OGG, RA, AAC, AU, AIFF, DTS, MPEG-1/2, H.264, etc. This marvelous DVD ripping software has the function of converting 2D movies to 3D format, brings GPU decoding and optimizes the encoding speed of H.264. The operation is more convenient with the “Express” and “Expert” interfaces to meet your different needs. There are many customized setups for you to choose, such as adjusting the movie background and the movie output effect, inserting watermarks, etc. This powerful DVD ripping program is featured to help you quickly and easily rip your DVD movie collections into 3GP, MP4, AVI, ASF, WMV, etc. that can be played by portable devices including iPad, iPhone, iPod, PSP, Nokia, Android, HTC, Archos, MP4 players and so on. With this program, you can watch your favorite DVD movie on your favorite mobile devices anywhere, anytime. Besides, if you desire to make sophisticated movies, this DVD ripping software is the right product which enables you to trim, crop, merge, add watermark or subtitle, adjust video playback effects, flip or rotate for perfect movie enjoyments on the go! Moreover, this software is designed to remove all protections like CSS, RC, UOPs and Sony ARccOS while converting. It can also convert and rip DVD to MP4 for mobile devices with a high quality by removing warning screen and watermark. 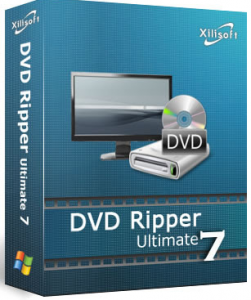 Xilisoft DVD Ripper Ultimate is powerful and easy-to-use DVD ripping software with the ability to rip DVD to almost all video and audio formats, for example, it can rip DVD to AVI, MPEG, WMV, DivX, MP4, H.264/AVC, RM, MOV, M4V, XviD, 3GP, MP3, WMA, WAV, RA, M4A, AAC, AC3, OGG, etc. With the powerful compatibility with iPod, iPhone, PSP, Apple TV, Xilisoft DVD Ripper Ultimate enables you to rip DVD to various portable media players supported formats. Additionally, it can help you clip video segment, merge several sources, crop video size, edit video effects, adjust subtitle and add watermarks/soundtracks. 123 Copy DVD Gold provides an efficient and progressive solution for ushering your media into the digital age and making it more universal with innovative file-conversion and copying technology. 123 Copy DVD Gold can quickly and easily convert DVD movies into high-quality digital files that you can access anywhere on your mobile phone, tablet, PC, iPhone, iPad, Apple TV and so on. The software can convert your video into a variety of the most popular file formats, including DivX, AVI, MPEG4, Windows Media Video and so on — it’s as easy as 123. 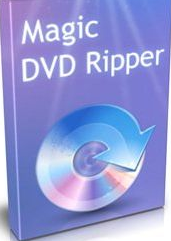 Magic DVD Ripper is convenient and powerful DVD ripping software which can rip DVD to VCD, SVCD, AVI (Xvid, DivX), WMV, MP3, MPEG2, MP4 (for iPod, iPad, PSP, PS3 or smartphone, mp4 player and so on) or backup DVD to hard drive without any loss of quality. You can enjoy DVD movies anytime and anywhere without inserting DVDs or burn them to blank DVD or CD using burning software. Compared with other DVD ripping software, Magic DVD Ripper comes with both converting and backup function with faster ripping speed. While other software may not can rip some certain DVDs. Magic DVD Ripper almost always works perfectly. The most compelling aspect of this application is how easy it is to use. Its minimalist interface leaves little room for guesswork. In order to rip a DVD, all you need to do is click “Add DVD”, load the disc you want to rip, select the video format you wish to convert to and click “Convert.” This process is as simple as the best DVD rippers we reviewed. This application covers the basics when it comes to available file formats. All the usual file formats like MP4, MOV, ASI and MKV are available. If you dig into the program a bit, you’ll find that you can adjust technical details like codecs, bitrate and all the rest of it. The result of a DVD ripping is as good as any other ripper we reviewed. There’s nothing to complain about here. 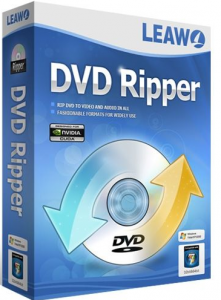 As we can see from the table comparison chart above, all of these 10 piece of best DVD ripper software support Windows operating system, which means their windows version can play the role of the best DVD ripper for Windows or the best Windows DVD ripper. Among the Windows supporting list, there are Winodws 7 and Windows 8, so each one of these 10 best Windows DVD ripper can be regarded as the best DVD ripper for Windows 7 or the best DVD ripper for Windows 8.